The history of the Department of Computer Science and Engineering was started in 1963 with the establishment of the Department of Applied Mathematics in the College of Engineering. As the study of computer science and engineering has evolved rapidly, our department has experienced dramatic changes for decades. In 1975, the Department of Computer Science and Statistics was established in the College of Natural Science. Since 1977 and 1990, the department separated its graduate and undergraduate programs respectively into two majors: Computer Science and Statistics. In 1978, the Department of Electronic Computer was established in the College of Engineering, which was renamed Department of Electronic Calculation and Engineering in 1979. Since 1980, the department started offering a graduate program. In 1989, the department's name is changed to the Department of Computer Engineering. 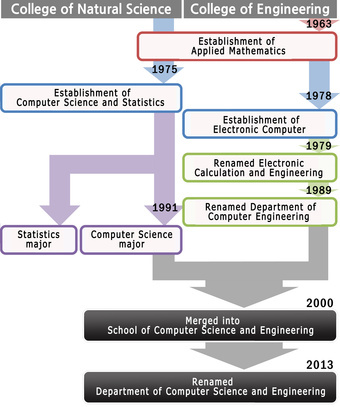 In 2000, the Computer Science major of the Department of Computer Science and Statistics in the College of Natural Science and the Department of Computer Engineering in the College of Engineering were merged to form the School of Computer Science and Engineering in the College of Engineering. In 2013, our department finally lands on our current name, Department of Computer Science and Engineering.